“This protest piece is in response to America’s longstanding obsession with gun culture and our government’s inability to honor the victims of mass shootings by distancing themselves from the homicidal policies of the NRA,” a news release from INDECLINE stated, according to Fox 5 in Las Vegas. Police began investigating after the vandalism was reported, and the message was taken down within hours. The sign stands off Interstate 15, less than five miles from the Mandalay Bay resort and casino, where a gunman opened fire on a crowd of concertgoers from the 32nd floor, killing 58 people and injuring hundreds more. The Oct. 1 attack was the deadliest mass shooting in modern U.S. history. 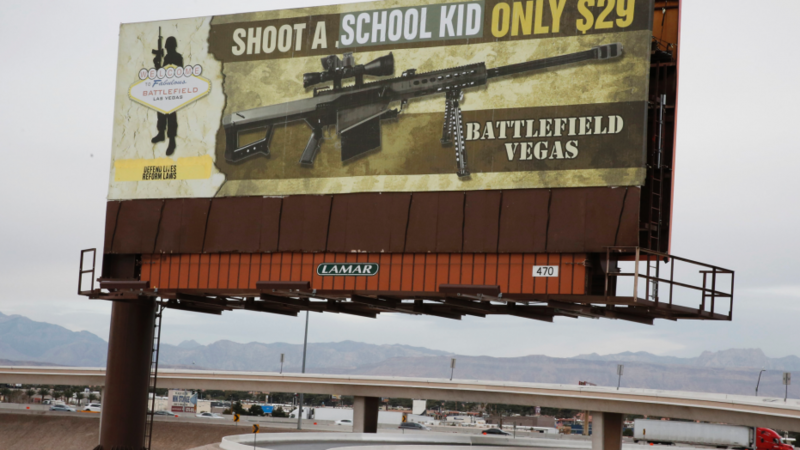 A Feb. 14 mass shooting in Parkland, Fla., that left 17 people dead was also used as inspiration for the billboard, a spokesman told AP. AP could not immediately reach management at Battlefield Las Vegas, the company in the original advertisement, for comment. INDECLINE also claimed to be behind the naked statues of then-candidate Donald Trump that popped up across the U.S. in 2016.